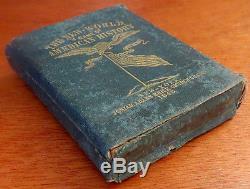 For your consideration is the antique card game, THE NEW WORLD: A GAME OF AMERICAN HISTORY by a Yankee. 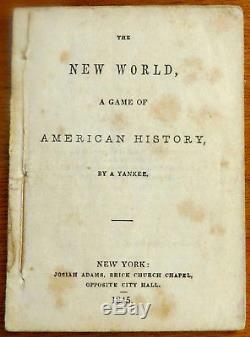 The game was published in 1845 by JOSIAH ADAMS. New York: Brick Church Chapel. There are 40 cards in the deck: 20 "Prime Cards, " with pictures, 20 "Secondary Cards, " for questions. 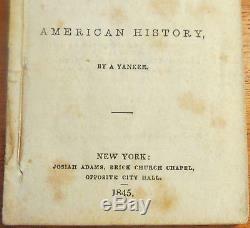 The object of this Game is, to present an outline of the history of our country, in a condensed yet attractive form.
" "The History is distributed into seven epochs. Virginia including Maryland ; the ii. New York with New Jersey ; iv. New England and Pennsylvania with Delaware. 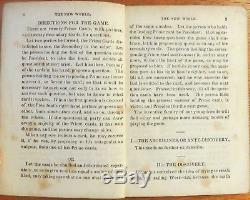 The Presidents to James K. Polk, who entered office in 1845, the year the game was created. The game is in the collection of. The Henry Ford Museum of American Innovation. It is listed in the. Guide to the Winterthur Library: The Joseph Downs Collection and the Winterthur Archives. The AGPI Game Catalog of the Association of Games and Puzzles International (AGPI# G-166). The cards measure 2-3/4 inches by 3-3/4 inches on card stock with plain backs. The 48-page instruction booklet instructions also measures 2-3/4 inches by 3-3/4 inches. The cloth-covered cardboard case measures approximately 2-7/8th inches by 3-7/8th inches by 7/8th of an inch. CONDITION : The game is COMPLETE in GOOD condition with INSTRUCTIONS and ORIGINAL BOX. 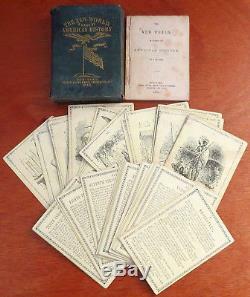 There are 40 cards in GOOD condition; age-toned, soiled and rubbed; but without creases, bends or folds. The thread binding of the instruction booklet is intact; the pages are rubbed and soiled. The top of the box is missing. The box maintains its gilt printing; it is soiled and worn with a gap at the bottom right. PLEASE MOUSE OVER THE IMAGES FOR CONDITION DETAILS. 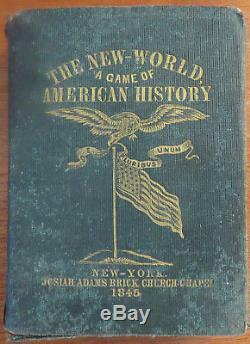 The item "Antique 1845 Card Game by JOSIAH ADAMS THE NEW WORLD GAME OF AMERICAN HISTORY" is in sale since Sunday, December 03, 2017. 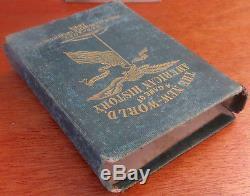 This item is in the category "Toys & Hobbies\Vintage & Antique Toys\Card Games". The seller is "peter-games" and is located in Denver, Colorado. This item can be shipped worldwide.